In celebration of its 20th anniversary, Fallout is free. Yes, if you played it new you are old now. 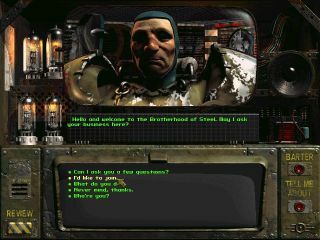 To celebrate the 20th anniversary of the original Fallout, Bethesda have made it free on Steam for the weekend. You've got until 11.59PM on September 30 (Pacific Time) to grab it and even if you don't install it, Fallout will remain in your account forever. Fallout's debut, or Fallout: A Post Nuclear Roleplaying Game to give it its full name, was a top-down RPG with turn-based combat that ran counter to the grain back when Diablo had made real-time combat the flavor of the day. Its juxtaposition of an irradiated Mad Max-style wasteland full of gangs with a future timeline in which 1950s science fiction dreams came true made for a memorable vision, and one that's ensured its legacy to this day. If you'd like to reminisce further, here's our retrospective looking back at the series from its debut through to New Vegas. Or you could just grab Fallout and start playing it now, because just between you and me the original is actually the best.